This Sweet Hot Pickled Peaches Recipe makes a great side for pork, chicken or burgers. You can also use this recipe for making Hot Pickled Apricots. 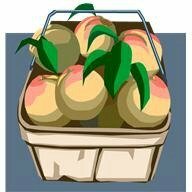 Recipe to Make Sweet Hot Pickled Peaches as a PEACH Side Dish served with Pork, Chicken, Burgers! Peel peaches (if you are using apricots, they may be left unpeeled). Follow this method to peel peaches. Halve and pit any larger size peaches, and set all peaches aside. In a large size ("Dutch Oven") pan combine the water, vinegar, granulated sugar, brown sugar, cinnamon sticks, gingerroot, red pepper, salt, mustard seeds and cloves. Bring the above mixture to a boil, stirring to dissolve the sugars. When mixture has come to a full boil, reduce the heat, and allow mixture to simmer, uncovered for 5 minutes. Add the prepared peaches, onion wedges, and strips of sweet pepper to the pickling mixture, and return to boiling. When the mixture has come to a full boil, reduce heat, and allow mixture to simmer, covered, for 5 minutes or just until tender, stirring gently a few times. Using a large slotted spoon, divide the peaches, onion, sweet pepper, and the cinnamon evenly among 4 clean, hot 1-quart jars (or equivalent). Pour the pickling mixture evenly among the jars. Allow jars with pickled peaches to cool. Use a slotted spoon to serve the peaches and drizzle with a little of the juices. Great alongside grilled pork, grilled chicken or burgers!